Orthotics are a device put into a shoe to help correct and prevent many foot problems. There are two types of orthotics- prefabricated and custom. A custom orthotic is molded to your exact foot shape while a prefabricated orthotic comes in standard sizes. For many adults with foot problems we recommend custom orthotics to aid in the treatment process. The orthotics are designed to correct any biomechanical issues with the foot and ankle. The orthotic will provide stability and control for the child. It can also help with leg length discrepancy. While we tend to encourage the use of custom orthotics for adult foot problems, for a child this can become very costly and unreasonable. Children's feet grow and change sizes every 2-3 months which means you would need to get a new custom orthotic every 2-3 months! 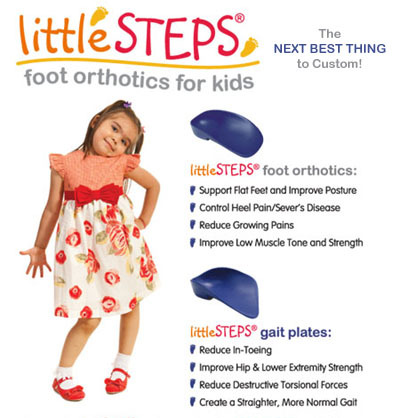 For a child, we recommend using prefabricated orthotics until their feet stop growing.